Airing down your tires for a trail ride leads to a smoother ride and better traction on rocks, but low tire pressures on the highway can cause excessive heat generation and a possible blowout which means that you must have a way to air back up after the trail. 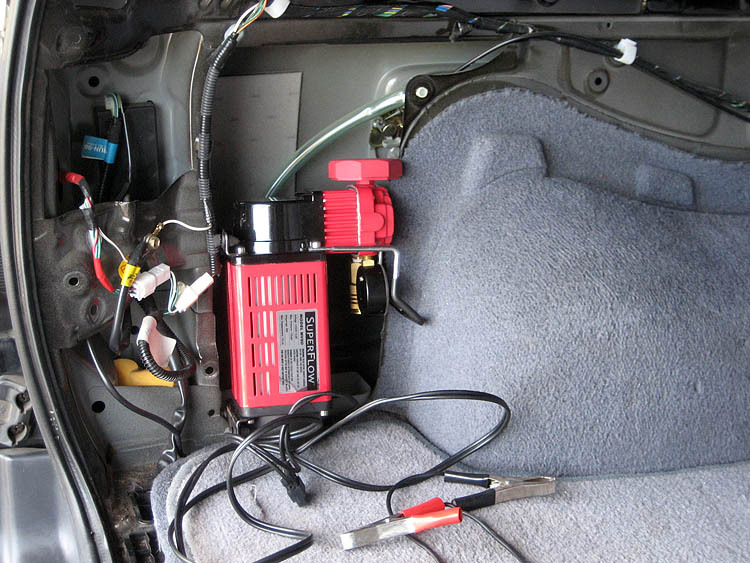 For years we would drive at slow speeds from the trail to the nearest gas station to air up, eventually I purchased a Puma 12v air compressor and tank which allowed me to air up at the end of the trail. The Puma is well built and puts out a decent amount of air, but due to its size it takes up a large amount of space in the trunk and is difficult to hard mount. I helped a friend hard mount a Puma in an Xterra and due to the complexity and cost related to mounting the compressor and tank in separate locations I decided not to go a similar route on my 4runner. A couple of years ago Kragen had the well know MV-50 compressor on sale for $25 so I picked one up. This compressor puts out less CFM than the Puma, but is quieter and much smaller. I've been using it exclusivly on trails for a while with no failures or mechanical issues so it seemed like a good candidate for an on board air (OBA) install. There are a few different possible mounting locations on the 4runner. The first is in the engine compartment where the benefit is proximity to the battery for easy wiring, but the big downside is that the compressor will reach thermal shutoff much quicker due to the heat from the engine. 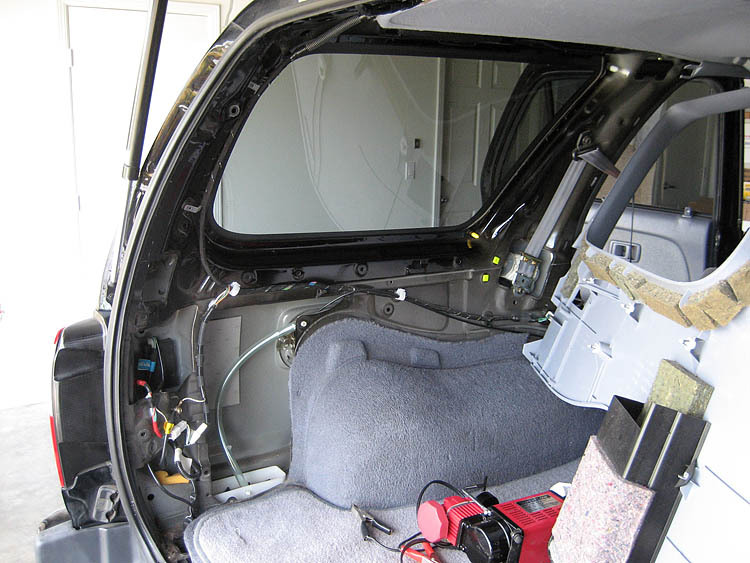 Other options are inside the ARB bumper or under the truck, but both of these locations are exposed to the elements which could damage the compressor. 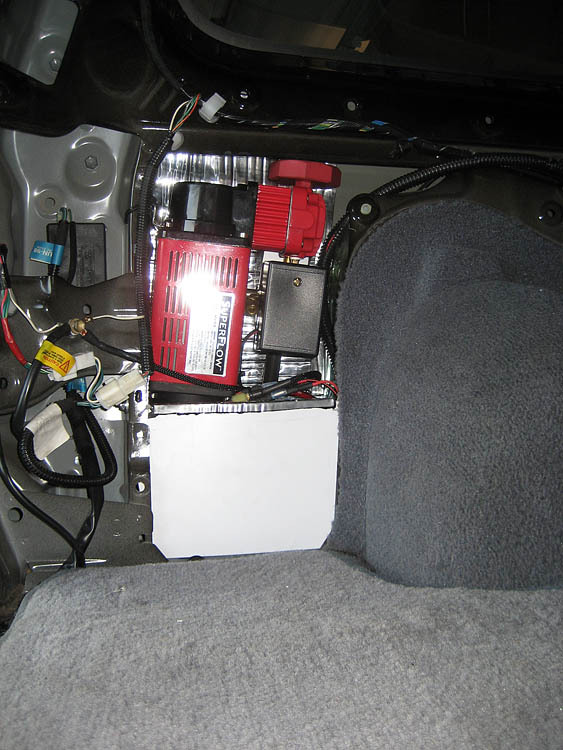 Another member on Yotatech removed the driver's side trim panel in the trunk and mounted a 120v inverter in that space. Based on his pictures it looked like the MV-50 might fit in that space so I remove the panel to investigate. 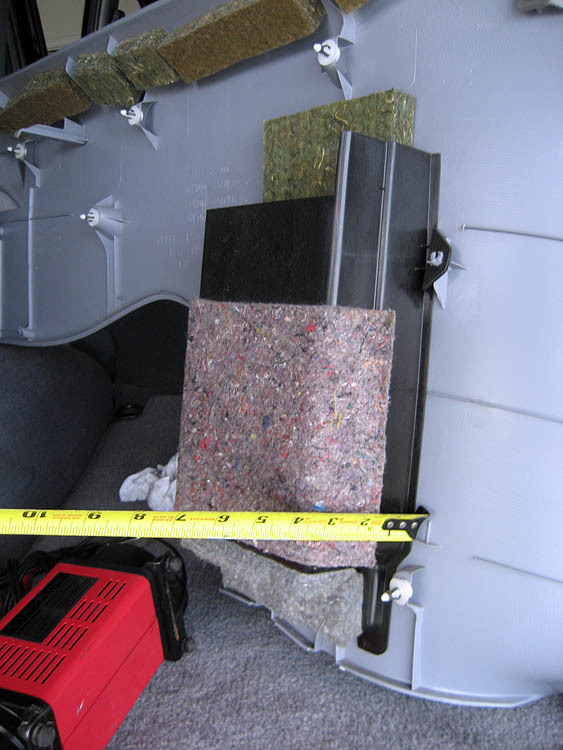 This first picture shows the driver's side of the trunk with the trim panel removed. The gas filler (behind the carpet) limits the space in the opening, and there is a drain tube that goes down into the passenger compartment vent. 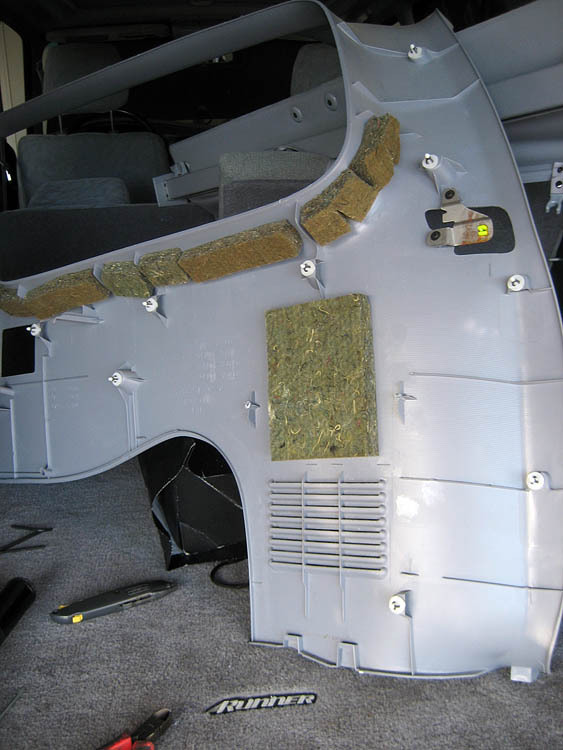 On the back of the trim panel there is a baffled plastic box that provides sound deadening for the vent, more on this in a minute. It's a tight fit but the MV-50 looks like it will if the drain and passenger compartment vent are moved. Here is a closeup of the passenger compartment vent. This allows air that enters the cabin via the HVAC system to exit without building up excess pressure. 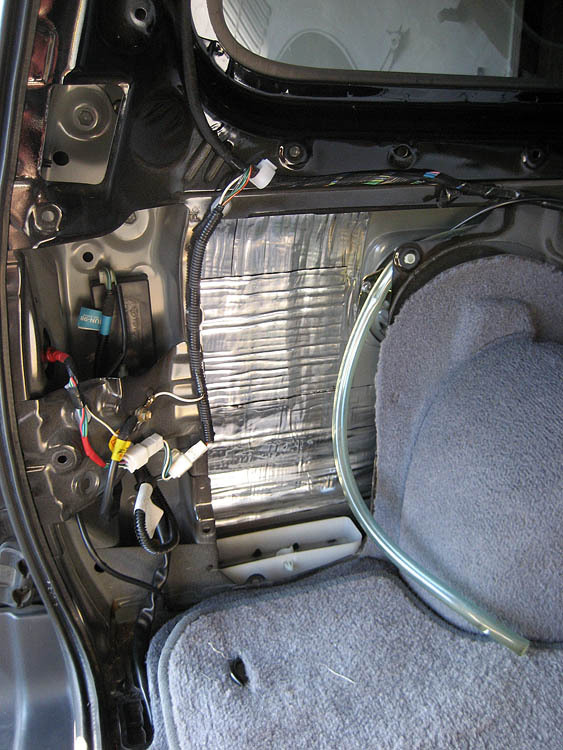 Since it vents to under the rear bumper Toyota has used several sound deadening techniques to prevent excessive noise. The plastic box acts as a baffle to increase the distance outside sounds have to travel and the wool felt absorbs sound energy and disperses it as heat. One fundamental tenant for my 4runner build is to keep as much stock "liveablility" as possible so it was important to me to keep some form of sound deadening in this location. With the baffle remove the vent in the panel can be seen. I tried driving around with the baffle removed and the level of road noise in the cabin noticibly increased. I had some RAAMMat left over from sound deadening the WRX so a couple of layers were applied to the outside skin to deaden any noise transmission. Now that the installation space was prepped it was time to get the MV-50 ready for install. In stock form the MV-50 is controlled by a relay and a on/off switch, there is no pressure switch to control output. For an OBA install a pressure switch is required to prevent damage during times when the compressor power is on but air is not flowing. The air output is small (~1/8" NPT) so a step up converter is required to get to the standard 1/4" NPT. In the following picture you can see that the air comes out of the compressor head, into a 1/8" NPT 90 degree angle, and then through a step up converter and into a T junction. One output of the T feeds into an adjustable pressure switch and the other output goes to a hose barb. 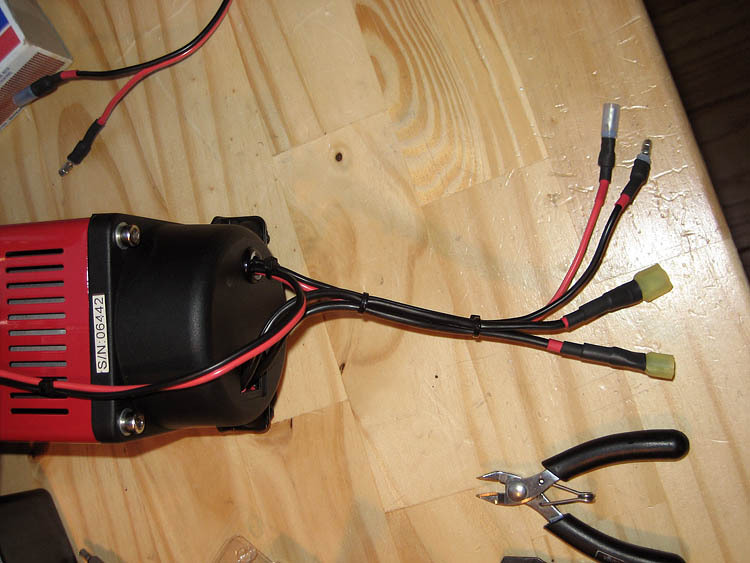 The pressure switch is wired in place of the stock MV-50 power switch and will be in series with the power switch being wired into the dashboard. There are four wires required for installation. 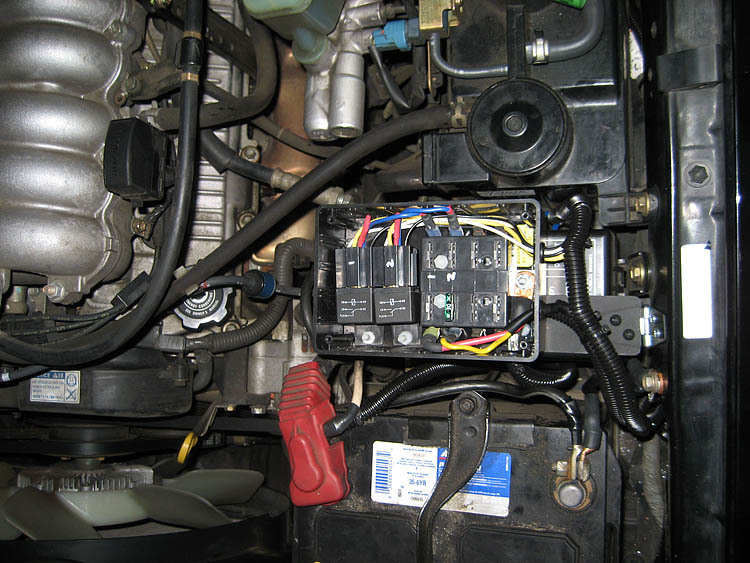 The two black wires are the positive and negative power leads. The smaller wires are for the on-off switch, because of the way the compressor's thermal switch in wired it the switch cannot just ground a single lead and must have two wires. There are crimp terminals on all of the wires so that the compressor can be removed for maintenance. At this point it was time to run the power and switch wires. All wiring from the compressor follows factory routing paths and goes down the C pillar and then under the floor trim to dashboard. 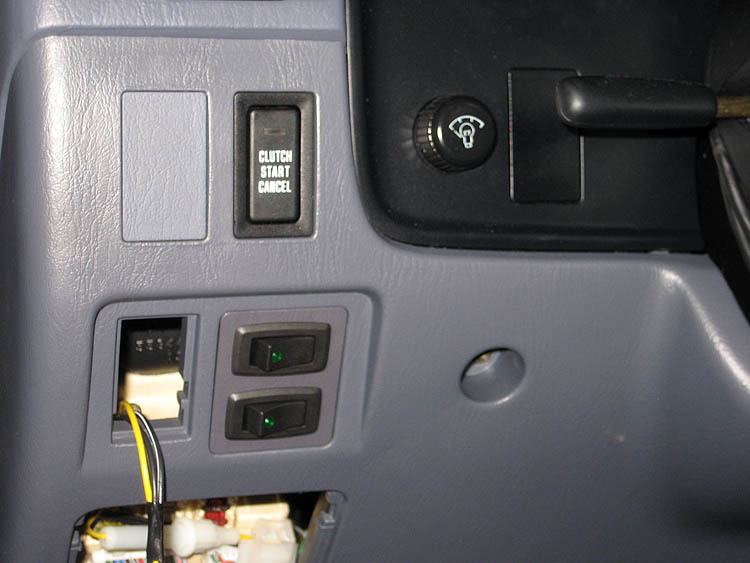 At the dashboard the switch wires split off, and the power wire continues through a factory grommet into the engine compartment. The power wire is 8 gauge with a 30A fuse and is wrapped in split loom in all places where abrasion could occur. 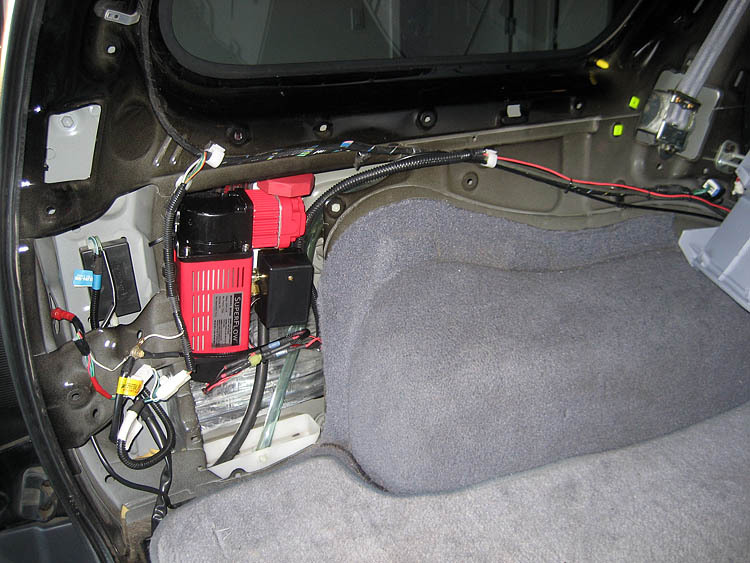 Here the wires run up the C-pillar and then follow the factory wiring bundle the rear of the truck. Here's a shot of the wires passing through the firewall into the engine compartment. While I had the dashboard apart I also ran a piece of multi-conductor stranded wire for future electronic accessories. The power wires terminate at my accessory fuse block next to the battery. There are more details on this in a different article on this website. The compressor is controlled by the lower of these two switches. The top switch will eventually control my rock lights, and the blank next to the gauge dimmer will be where my e-locker switch resides once swap 3rd members. 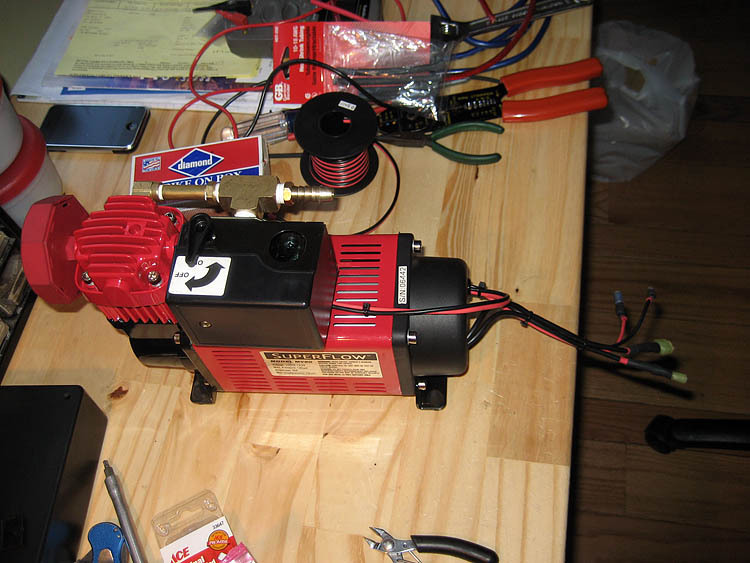 Once the wiring was done the last step was the mount the compressor. I was a bit worried that sharp edges on the compressor would damage the RAAMMat so they were covered with a foam for protection. 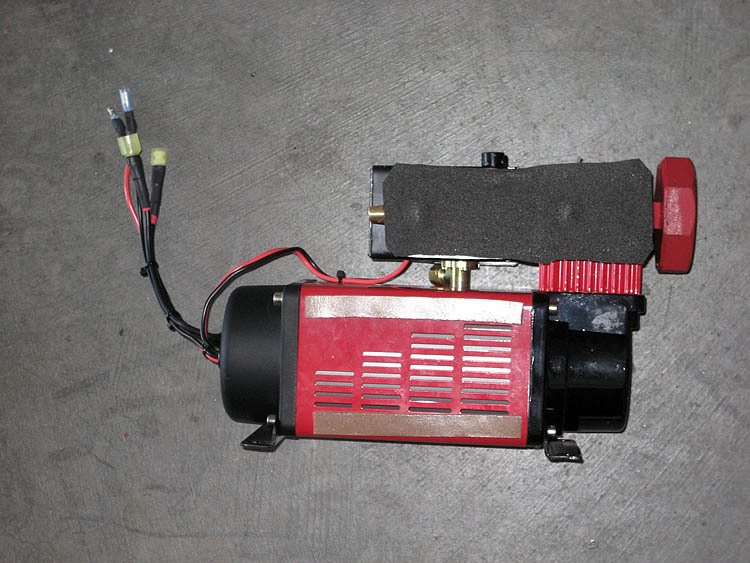 The compressor's feet are bolted through rubber bushings so that it can vibrate while running. The air filter at the top has about 1/8" clearance between it and the top of the compartment. All wires are zip tied so the connectors don't come apart and the air hose runs down through the cabin vent with the drain line. As a final step I covered a piece of styrene with RAAMMat and ensolite foam and place it as a baffle in front of the vent slats in the trim panel. 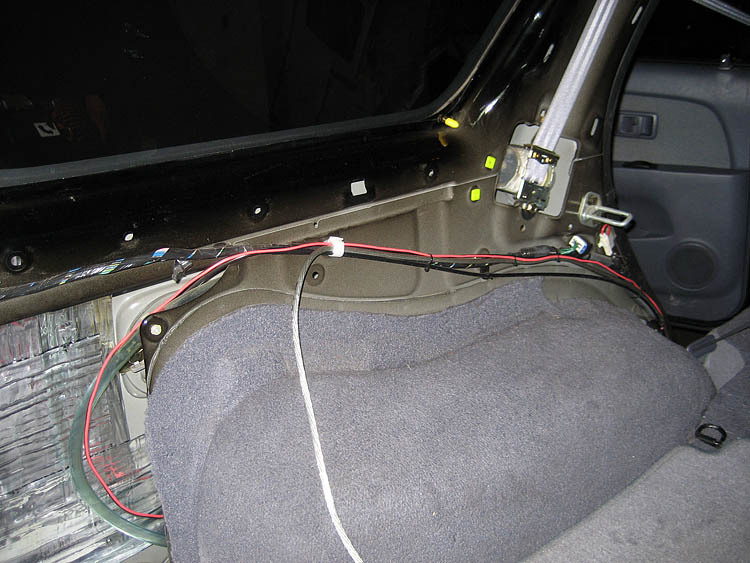 This helps deaden sound transmissin into the passenger compartment. 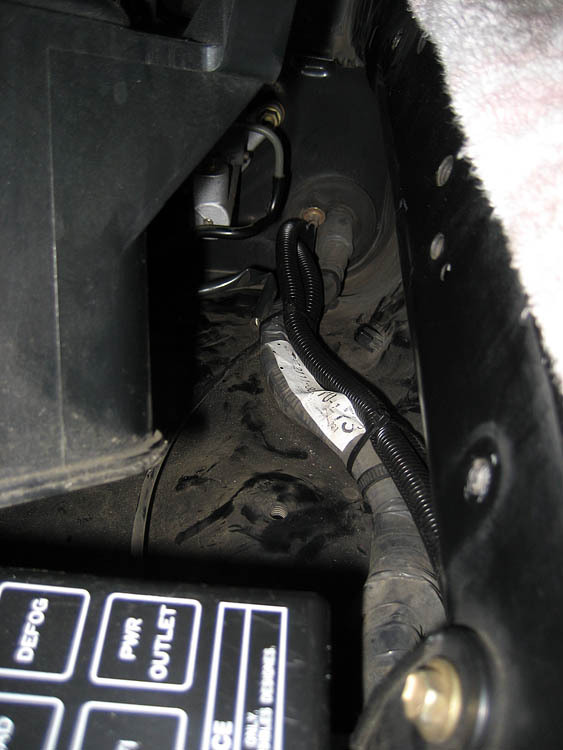 The air line exits the cabin vent under the rear bumper and runs along the top of the trailer hitch where it is easily accessible from the outside. This modification required a lot of test fitting and tweeking but I'm extremely happy with the outcome. No storage space was lost, and I cannot discern any increase in road noise due to the replacement of the stock sound baffle. After a couple of outings I plan to check the rubber isolators that hold the compressor in place, but otherwise everything should require no maintenance moving forward. A few years after I did the initial install I sealed the tow hitch and plumbed it into the system to create a ~1 gallon air tank. At the same time I ran an air line to the front of the truck so I now have front and rear air fittings. After about 4 years of use the MV50 started struggling to get up to pressure. I took it out, pulled it apart, and discovered that the valves were worn out and that there was a bunch of crap in the compression chamber. I cleaned everything up, replaced the valves with shim stock from a set of feeler gauges, and it now works great again. At the same time I also drilled and tapped the output to 1/4" NPT to get higher flow.